As a natural compliment to our longevity medicine services, Boulder Longevity Institute also proudly offers a suite of sophisticated and medically-minded aesthetics services. Our clients often find the changes they experience internally from our longevity medicine naturally lead them to explore how that same BLI approach can help them look as good as they feel. Quite simply, when people start feeling vibrant on the inside, they want that same vitality to shine through their appearance. Our approach to skin care integrates the same researched-based approach we use for longevity medicine. Because of our extensive clinic experience and professional relationships, we’re able to offer some of the worlds more effective medi-spa treatments under the watchful direction of Dr. Yurth. BLI offers aesthetic skincare services to clients as stand alone treatments or as part of our comprehensive anti-aging medicine services. Micro needling is a highly effective, medical grade skincare treatment. It harnesses the body’s natural healing mechanisms to stimulate new collagen production in the skin. Clients are seeing results formerly only attainable from painful lasers and expensive surgery. From this sort of facial resurfacing you can expect to see skin tightening, a visible reduction in the appearance of fine lines and wrinkles, improvement in the appearance of stretch marks and overall skin elasticity. The Biofusionary Bebe machine utilizes biomagnetic induction to create a long term collagen response in the deeper layers of the skin. It is a perfect and deeper compliment to the facial resurfacing of microneedling, and can also be done to improve skin tone and elasticity on other parts of the body like the face, neck, stomach, and knees. 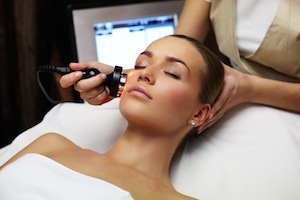 The machine uses a warming wand to stimulate the deeper layers of the skin into a healing response from the inside out. The sensation is similar to a hot stone therapy but with the heat instead originating deep in the tissue and emanating towards the surface.